Introducing Assembly – An iconic Multi-use Office Design in Downtown Norfolk — Campfire & Co. Working alongside our friends at WPA, Campfire & Co. is leading the interior design of Assembly – an iconic building campus and community of inspiring creators and technology innovators in downtown Norfolk. Brought to you by the digital pioneers at Grow, Assembly is designed to connect. Leading companies, aspiring startups, and talented freelancers will come together under one roof, sharing energy, inspiration, and resources to make the building more than the sum of its parts. Grow is also the team behind our multi-functional pop-up design project, ENJOY:. Grow’s founder Drew Ungvarsky is no stranger to dreaming and designing beyond the standard ideas of what a professional space can be and provide to the community. 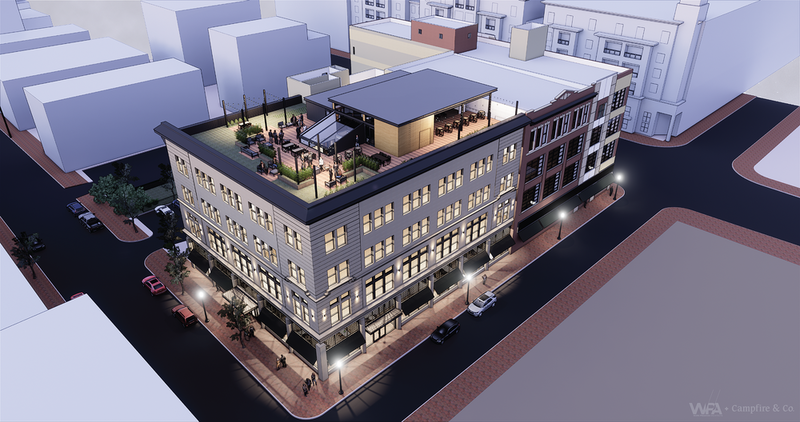 An adaptive reuse project, Assembly will restore three historic department store buildings to their original beauty, and connect them together as a modern office and community hub. Every aspect of the space is purpose-built for connections and collisions, and to support the common needs of creators. Assembly will share a large rooftop deck and central gathering spaces, as well as resources like a recording / podcast booth, extra meeting rooms, an event space, a game room, bike storage, shower facilities, a library, and more. On their own, small and independent companies must choose selectively from business resources and cultural amenities like these, but sharing them provides more access for everyone. Grow is designing Assembly to support and inspire the entire regional community of creators and tech innovators. The building will host regular industry and cultural events from outside groups and organizations, as well as Assembly’s own programming. Copy adapted from Drew Ungvarsky’s Introducing, Assembly.